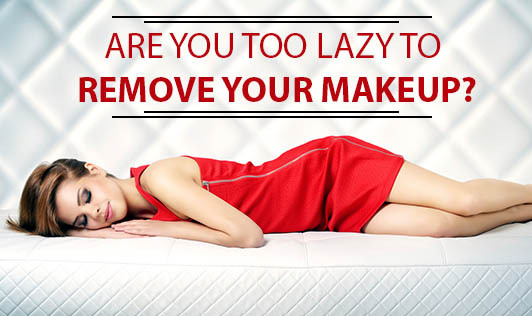 Are you too lazy to remove your makeup? Sometimes, we're just too exhausted to take off all the makeup before bedtime, especially when our cozy covers are calling for us. You need to remove your makeup if you want to maintain good skin. The skin renews itself while you sleep, and when you leave makeup on, you are preventing that from happening. Our skin is covered with pores and these pores not only allow us to sweat but they also secrete sebum which is a waxy lubricant that helps to keep the skin moisturized. The sebum also helps in removing dead skin cells and other irritants from the pores. Not removing makeup before bedtime can also lead to the appearance of more acne and blackhead breakouts. Not removing makeup at the end of the day will mean that you go to bed with lots of free radicals, caused by pollution that is clinging to your makeup, on your skin. These free radicals contribute to cellular damage, stinging eyes, and early aging. The skin is said to repair itself at night and cosmetics such as foundation, mascara, blush etc can all be detrimental to its health by clogging pores and not allowing it to breathe. Makeup residue and the substances that make your make up can also cause many skin imperfections when left for hours on end during the night. A quick way to clean off all your makeup residue, dirt, and oil, after a long tiring day, is to use coconut oil. Dip a cotton ball in coconut oil and wipe off, this will help you clear pore-clogging impurities and leave your skin thoroughly cleansed and moisturized. If you're too tired and removing makeup feels like a chore, the least you can do is keep the makeup removal wipes handy, but never sleep with your makeup on! If you currently don't remove your makeup or wash your face before bedtime, you'll probably want to rethink that practice!